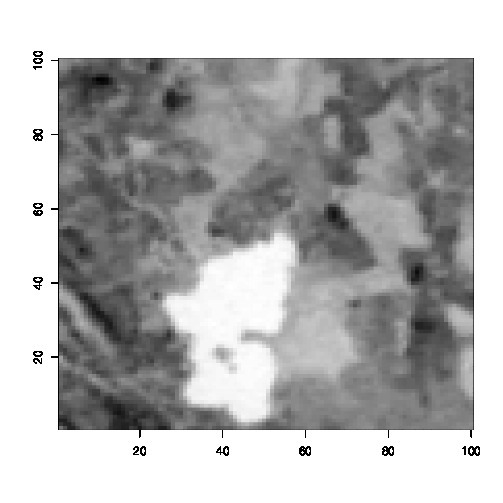 The image of Lake Mentieth in figure 8.6 of Bayesian Core is upside-down and back-to-front, so to speak. Also, I recently read a paper by Lionel Cucala & J-M Marin that has the same error. This is due to the difference between matrix indices and image coordinates: matrices in R are indexed by [row,column] but image coordinates are [x,y]. Also, y=1 is the first row of the matrix, but the bottom row of pixels in an image. As can be checked on Googlemap, the picture is indeed rotated by a -90⁰ angle and the transpose correction does the job!